YAY! I'm back in action! Ok, I took it a little easy today and decided to stay away from anything heavy or chocolatly, but I did head back into the freezer for the first time since Thursday (I think it was Thursday, the end of last week was a blur for me with a gigantic lack of sleep, which is probably why I got sick). I never know how much to share, but my appetite has been very confused as I recover. We keep our shelves highly diversified and I didn't want any of it. I'm just unamused by food at the moment. I'll be hungry for a milkshake for about 3 seconds and then suddenly switch gears and go no way am I drinking anything cold and heavy right now. Instead, I'll admit that I've been eating carrots all day ....don't ask me why. Then, for whatever reason, the urge hit me at around 7:30 tonight. 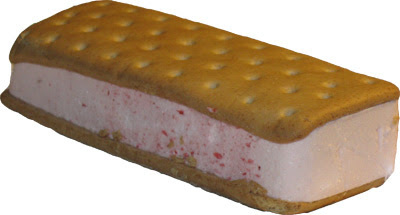 I finally realized what I was in the mood to try - The Blue Bunny BIG Double Strawberry Ice Cream Sandwich, a mere George Washington in the Wal-mart freezer section (sorry, not sure where else to pick these up). I like strawberry Sedonas so much, it just seemed like something I needed to try. I also like the fact that I can buy just one so there's no risk of wasting the whole box. Now that's what I call an ice cream sandwich! I can openly admit that I'm one of those people that tends to eat ice cream sandwiches in pairs. I can't help it, I'm hungry! Those strawberry dots may look a little weird on the side, but once you dig in they look like your standard swirl. It's also a little squished in the picture, but that's from being bumped around the freezer for the last couple of weeks. Here's a side by side view with another Blue Bunny ice cream sandwich. They are about the same width and length, but the strawberry is definitely more stuffed, and it's a nice stuffing too. It's an impressively fluffy texture actually. It tricks your brain into thinking it's a nice fresh treat instead of some frozen dessert. Wait, that doesn't make sense ....or does it? The flavor and texture combo can best be described as a vanilla cupcake with a nice strawberry frosting. It even smells like a cupcake! This sandwich comes together surprisingly well. I was pleasantly surprised. It's not even a heavy snack. Even the wafers are nice - sure, they might be a smidge dry, but I'm just not sure because there is so much ice cream here that it really doesn't matter. Nice job Blue Bunny, this was a nice treat to get rolling with. No, I wouldn't eat this if I wasn't in the mood for strawberry, but if you are in the mood for strawberry, or even a cupcake, this should hit the spot. Would love to buy some but no one in our area seems to sell them. I went to the store locator and it said both Kroger and Meijer sold them. My area is 48473. None of the stores listed sold this product.